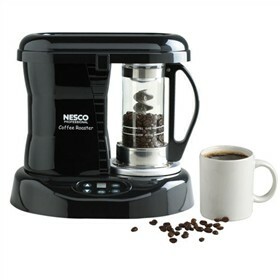 The Nesco CR-1010-PR is a coffee bean roaster which brings the freshness and quality of roasting fresh gourmet coffee at your home. It creates an even roast and uniform color while controlling the roast from light to dark. The roster features Patented Catalytic Converter Technology that significantly reduces smoke and odor and gives you the best coffee. It comes with pre-set digital controls and roasts up to 1/3 lbs of beans in only 20 to 30 minutes. The NESCO-CR-1010-PR has many exciting features for users of all types. You can extend the lifetime of your NESCO-CR-1010-PR with the purchase of a FactoryOutletStore Factory Protection Plan. See the NESCO-CR-1010-PR gallery images above for more product views. The NESCO-CR-1010-PR is sold as a Brand New Unopened Item.